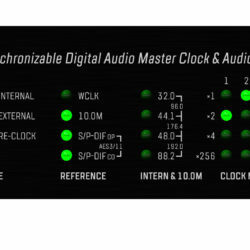 Similar to the MC-3+ USB, minus USB connectivity, the MC-3+ Smart Clock has been developed to significantly improve the playback of digital audio in two ways: At first by clocking devices with extremely low jitter Word Clock signals and secondly by aggressively re-clocking incoming digital audio signals. One of the end goals in accurate digital audio playback is reproducing each sample in the audio stream accurately, or “in-time”, as each sample is played. Any variance in the timing between samples results in phase noise and jitter creating distortion in the signal, degrading audio quality and overall imaging. 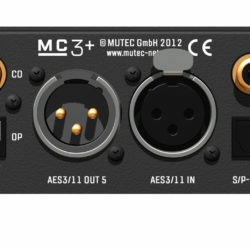 The MC-3+ uses a combination of MUTEC’s 1G-Clock technology and proprietary re-clocking algorithms to reproduce the audio stream as accurately as possible, resulting in improved sonic accuracy, detail, and imaging. In addition, the MC-3+ incorporates ultra-low noise power supplies and isolated components within the circuit to reduce unwanted noise to an unprecedented low level. While a standalone clock generator, the MC-3+ can also act as a clock distributor improving the level of sound reproduction in your entire audio system. It is also possible to lock the system to higher clock references such as the MUTEC REF 10 where even higher performance may be required. Additionally, the MC-3+ features anytime fail-safe clock generation for reliability during live events, recordings, and playback.